Swimming at the public pool. I haven’t been in more years than I can remember. We are having a sleepover with one of my friend’s kids and we needed a cheap and fun activity. He loves swimming, and it was $10 for all of us, so we went. Yes, Tony Clement spent our Canadian Taxpayer’s Money somewhat frivolously and unfettered, but he did build the town of Huntsville a nice pool and Summit Center. There are two pools, two arenas, a walking/running track, space for events, a coffee shop, a fitness center, space for classes and an active living centre all with beautiful Muskoka architecture. Now did Obama or Sarkozy really care about the pool after spending six hours in our town for the G8? I don’t think it made any difference to the any of them. I’m betting that they spent their time in limos on the highway – did their photo-op on the lawn at Deerhurst Resort, met for an hour for appearances and then headed back to Toronto for the G20. But given I have not yet heard back on my Secret Service application, I cannot be sure. Nonetheless, Huntsville got all of this stuff that really was not warranted for the G8. Is anyone here complaining? Of course not. Why would we? The pool is a fairly standard; high ceilings, made of cinder blocks with that cavernous feeling. It is amazing how swimming pool technology has not changed – it is the same round lane dividers, the same lap clock with the same coloured arrows that I have yet to understand completely, and the same black t-bar lanes on the bottom. At the end of the large pool there is an expensive large scoreboard – wonder where the CBC’s funding went? – and the little mini swim meet diving boards. The toys for the kids were robust and ample, and three of the four walls have windows for viewing on the high- or low-level. There is even a bleacher balcony inside the area so fans can cheer on the racers. There is a large whirlpool and a smaller pool for the younger kids to learn. All, and all a wonderful facility. The hot humid air, the echos, and the smell took me back to swimming lessons in the Cranbrook public pool with Mrs. Hayes. Pool swimming has always been so much more comfortable to me. Yes, I live in Muskoka now, and I swim in the lakes here, but I am always slightly paranoid of my wedding rings sliding off to never be found, water spiders attacking me from the dock, touching seaweed (lakeweed? ), getting trapped under a dock, or being hit by a boat. No so much that I cannot enjoy a day on the lake, but these are all cares that do not fetter pool swimming All of my neuroses slip away, and I can float, dive, and swim to my heart’s content. April 14th, 2012 Extra-Ordinary: Safe from imagined dangers – and I am sure germs – at the public swimming pool. This can’t be right. I think my scale is vindictive because I am ignoring its “BATT LOW” flashing. But yet, my “comfy” jeans are tight this morning. Ahem. Tight again. I don’t want to write about this particular subject – it all feels very “Bridget Jones” and makes me feel like I too am caught in the endless parade of women obsessing with their weight and appearance. There is a “feel good in your own skin” aspect though, and I haven’t felt good in my skin for a while. And just like anytime I find something in my life I don’t like, I ignore it for a while, then eventually take action. By action I mean I start “things” or “challenges”. Back in January 2008, we wanted to save a bit of money, so we decided to spent no money on food whatsoever. Only eat what was in the house and freezer. No groceries or restaurants. By January 29th, there were some pretty inventive menus being dreamed up and pretty much just condiments smoothies. Thank goodness for frozen fruits and veggies or we might have developed scurvy. November 2007: never drink a diet cola again. Successfully completed. But My god, summer is coming. My sweet fizzy friend so perfect on a long hot humid summer day. I miss you, but we were just no good together. February 2011: We only spent cash I was bringing from serving – and let me tell you cash from serving is pretty slim pickings in Muskoka in February. That almost became a January 2008 repeat. Or this past January when we decided to adopt a vegan diet for knowledge and to save the earth. Boy, did I miss eggs and the earth apparently is still in jeopardy. So, when I see these numbers on the scale and am facing shrunken short syndrome, action I do take. That means a challenge, a “thing”. So, I dreamed up “Fit April”. I may it change to “Active April” due to the alliteration. But we’ll see, because then I’ll have to change all the letterhead, and the website, so it would add in unnecessary costs in a start-up year. 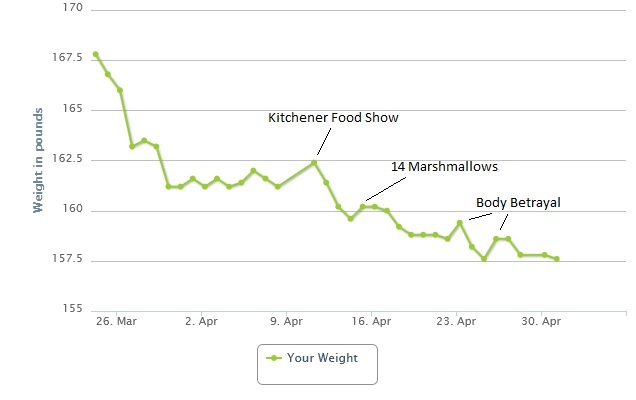 Fit April 2012 is a challenge to lose 10 pounds by the end of April. That is about 6% of my body weight and I think quite doable. And Emile is joining me on this quest, but he hasn’t set his goals yet. We’ve thrown again some target activities. We both need to run/walk/crawl 20 kms a week and exercise an average of 5 times a week. Other goals to be added. But the best part is I signed us up for a 5 km run at the end of April! That seems fun now. 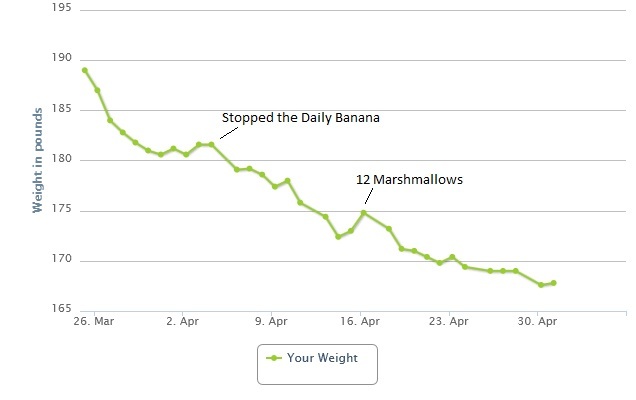 So, you can see Fit April isn’t totally defined yet, but we are using LiveStrong to track our calories and exercise. I used this in the past and it is fairly simple and easy, so figured the best thing to do is to use it and sign up Emile. As I was updating my information on LiveStrong, I came across a tool that allows you to add a brag banner to your website. Oh, that’s just great! Terrific. 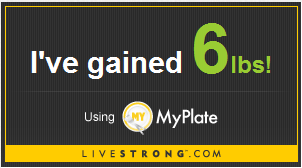 Thanks a lot LiveStrong.